Throughout the past 10 years, the show laser light industry has undergone, and still undergoes, a significant change process. Read here about the Laserworld story and how it has changed the laser business. Throughout the past 10 years, the show laser light industry has undergone, and still undergoes, a significant change process: The manufacturing of show laser light systems has separated from the laser show creation and laser show production. Some of the formerly big names in the industry have vanished or have been sold. Technological developments made home-building of show laser light systems uneconomical, lead to a significant price drop for laser systems in general and provided new opportunities for high precision manufacturing specialists to develop more and more advanced laser source technology. 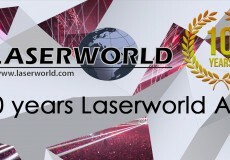 Throughout the past 10 years, the Laserworld AG with its Laserworld Group actively took part in the change process of the industry: Technological and product innovations combined with a holistic economical approach quickly lead to significant market shares and made the Laserworld Group being one of the largest show laser light manufacturing and distribution companies in the world. Martin Werner, the founder and CEO of the Laserworld AG, started with changing the markets by importing custom-built or custom-modified low-priced laser systems from China. Soon own production lines were established, the product portfolio grew year by year and end of 2007 Laserworld AG was founded at Lake Constance, right next to the border to Germany. The establishment of a management structure for the company in 2009 paved the way for the Laserworld Group as global group of different companies with different responsibilities under the roof of the Laserworld AG. In 2008 Laserworld began to use SwissLas high precision diode array modules in red and blue for the high professional product ranges. The significant price drop for the blue 445nm diodes in 2010 made the development of the extremely compact Pure Micro laser systems possible, which initiated a general downsizing run in the industry. In 2011 Ray Technologies (RTI) became part of the Laserworld Group, as well as Laserworld UK, Laserworld China and Laserworld USA. 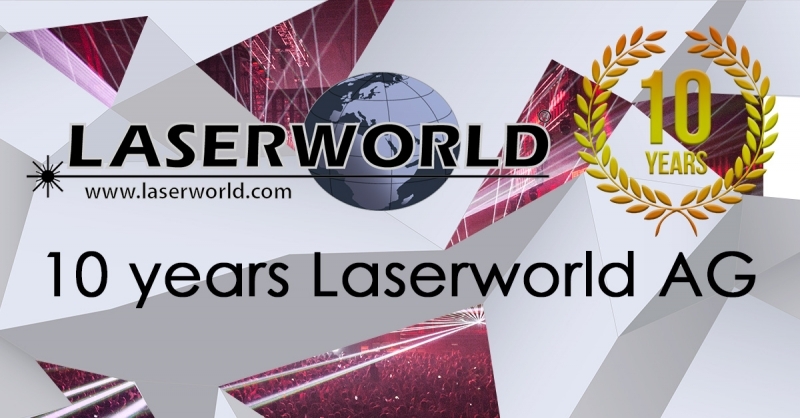 More international entities, like Laserworld Ibérica, Laserworld Korea, Laserworld India, Laserworld Turkey as well as Laserworld Asia have been added to the Laserworld Group through the following years. End of 2015, tarm laser technologies joined the Laserworld Group, too. Meanwhile the central logistics center of the Laserworld Group as well as the central Service Center have been moved to Valley (Bavaria) in Germany. What made Laserworld that successful? It were the customers. And understanding the customers’ demands. Unlike many other companies in the laser show industry, Laserworld did not grow from a small workshop, where a technician built laser units to use them for his own shows. Laserworld grew from an economical approach towards a technical topic: Offering show laser light systems for different customer groups meeting the specific demands of each group. Synergetic effects within the company group as well as volume-based sourcing allowed for a very competitive price structure and a high level of standardization and streamline processes. Laserworld hired experts in their field of business: Expert technicians, logistics experts, Sales professionals and Marketing magicians. That way the expert technicians do not need to do anything other than being experts in laser system development and manufacturing of high end units, which improved efficiency to the max. Laserworld knows the show laser light market very particularly. New innovations became rare and only the larger companies were able to push product development further. The base technologies used by many smaller manufacturers are not the same as the technologies large scale high end manufacturers like RTI use, as the technological development of laser diode arrays has in fact gone much further than just combining single laser sources - it’s not possible to achieve this technological level without significant investment into product development any more. The expansion of the Laserworld Group has not ended yet: New sales offices in different markets will be established and more partners will join our network, and potentially also the Group itself.